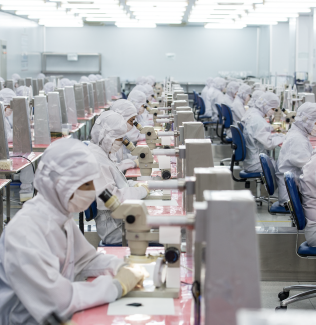 Compass was founded in 1997 with an ambition to be the world’s best flexible printed circuit board (FPC) supplier, and a ONE STOP SOLUTION provider for turnkey MEMs, Sensors and OLED/TDDI modules. Our customer-driven philosophy and innovative manufacturing techniques have contributed to the success of many products from some of the world’s most renowned brands. By leveraging our state-of-the-art infrastructure and waste-minimizing LEAN practices, we help companies design, manufacture, assemble and launch their products quickly, affordably and in the most efficient and cost effective manner. To be a world leader in high-density interconnect IC assembly packaging materials. To bring "Flexibility to Life" by providing Best-in-Class products in terms of Speed, Productivity, Technology and Services that empower businesses around the world to reach their full potential. State-of-the-art automated reel-to-reel production lines. World-class clean-room facilities designed for sub-micron lithography. Training and developing resources to carry out hi-tech research and development. An unrelenting focus on Quality, Technology and Speed. Flexible PCB manufacturing, assembly and testing done under one roof. High speed to market, and competitive Total Cost of Ownership. We are proud of our Hong Kong heritage, and proud to make all our products entirely within Hong Kong in our own factory, and to our own exacting standards. Hong Kong is one of the world most open cities, it is governed by the rule of law, with an independent judiciary, and is subject to international standards and all recognized international business covenants. The territory is regularly recognized as one of the best places in the world to do business. Intellectual Property Rights are rigorously protected by law, and business is conducted to the highest international standards of propriety and integrity.